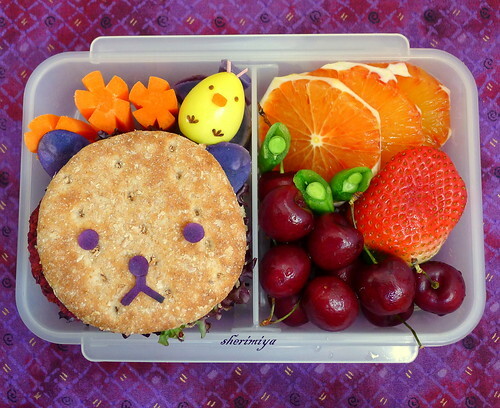 Rilakkuma and Kiiroitori Beet Burger Sandwich Bento, a photo by sherimiya ♥ on Flickr. Recently I've discovered the joy of beets. Beets, beets, beets. The only way I've ever prepared beets before was roasted and tossed in salad. But I love the flavor and figured, why shouldn't we try to fit them into a main dish meal? Today I made beet bean rice burgers which happen to fit perfectly inside these mini whole wheat sandwich rounds. I made these sandwiches with red leaf lettuce, and melted some swiss cheese on top. 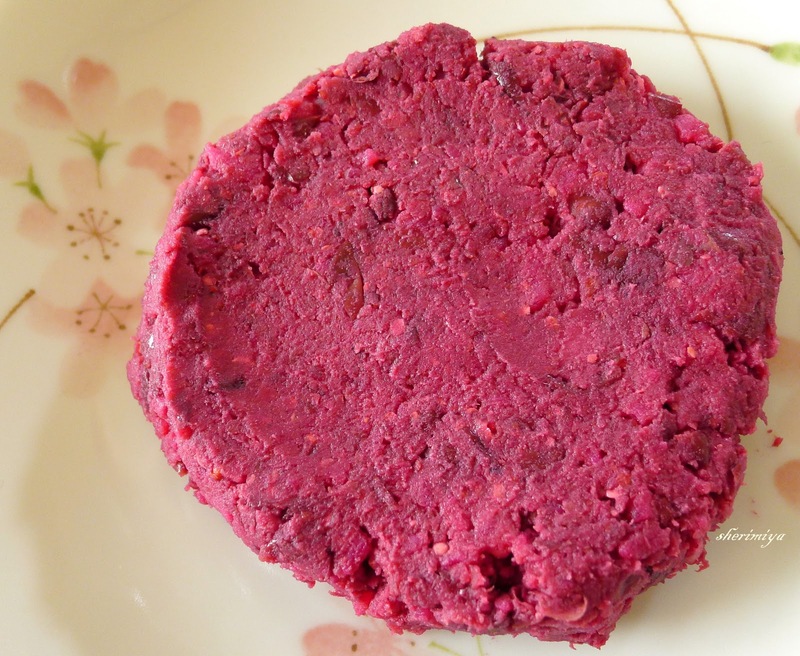 I got the idea for these burgers from the plethora of online copycat recipes that tried to replicate the famous Northstar Cafe beet burgers. I've never had those Northstar Cafe veggie burgers, but the pictures and the glowing review make me want to. I really wish I had taken a photo of the burger itself so you can see how red it really looks. ETA: I took some photos; see below. It's pretty cool; you can kind of see part of it at the left side of the bun. I layered two mini burgers in this bento box, and decorated the round bread with Rilakkuma's face cut from Okinawan sweet potato. I added carrots and his pal Kiiroitori (a turmeric-dyed quail egg with nori and carrot detail). Other side has blood oranges (sadly not very vividly colored), strawberry, peapods and cherries. Here's my sort-of recipe that I borrowed from here and greatly changed, because I like the flavors of these spices together. P.S. Don't wear white while making this. Mix rice and beet well, until uniform color. Fork-mash the black beans, and add. Mix well. Stir in the rest of the ingredients. My mixture was pretty sticky and a bit difficult to mix, but the stickier the mix, the better it stays together as a patty. Taste the mixture and add more spice if you need to. Use an ice cream scoop to portion out the burger mixture, and shape into a ball. Flatten with a flipper and place into a heated, oiled pan on medium high heat. Cook for 2 minutes, or until you see a crust form on the bottom. Mine kept its integrity pretty well, so it was easy to flip over. Cook the other side another 2 minutes or so. Put some grated cheese on top to melt if you like. Toast some mini buns or sandwich thins, and serve with fresh greens, onions and tomato. Delicious! thanks for the recipe, Sheri..and I assume both beet and beans are not cooked, right? MewlKitten, you should! They're delicious. Thanks Lina! If you like beets, you'll love it! Interesting recipe. And the bento looks lovely as always. Love the little quail egg. Beets are easy to get here, so I'll try these for dinner one night next week! Thanks for another great recipe! And Rilakkuma is my favorite character but that little yellow Kiiroitori stole my heart! Too cute! Every square inch of this bento makes me smile!! And what a wonderful new way to use beets...inspiring. Your RK bentos are just too delightful, Sheri! another healthy burger patty option, love it! adding these to my ever-growing list of healthy 2012 recipes to try. adorable relax bear and birdie friend, love how these simple details create such recognizeble friends! Thanks very much BentoBliss, berrygirl, Natakiya, Aarthi, Bentobird and megan! I've never had a beet burger before, and when I first heard of it I was shocked. But I love the moist and beety flavor. It adds a nice texture to the normal bean burger. Hope you can try it and enjoy it as much as I do! love the color and it sounds like it would taste really good! At first sight I thought that ball was ice cream! 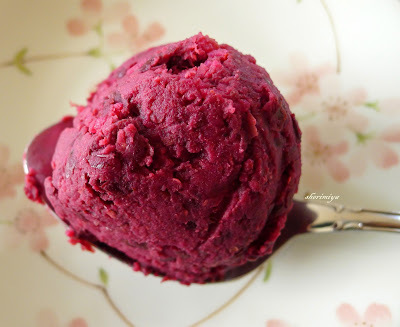 Hubs once had beetroot sorbet as hors d´oeuvre and since then I am obsessed about the recipe :P.
Adorable bento, a relaxing bear is what I want to be :D.
Haha I thought it was ice cream too! Look how beautiful the color is!! 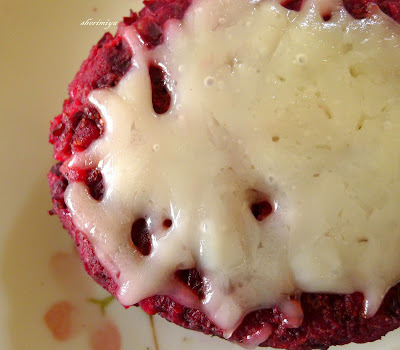 I love beet and this is new way to eat it. I love it! Now I can't look at it without thinking of beet ice cream too! I really wonder what the kids would think of it? 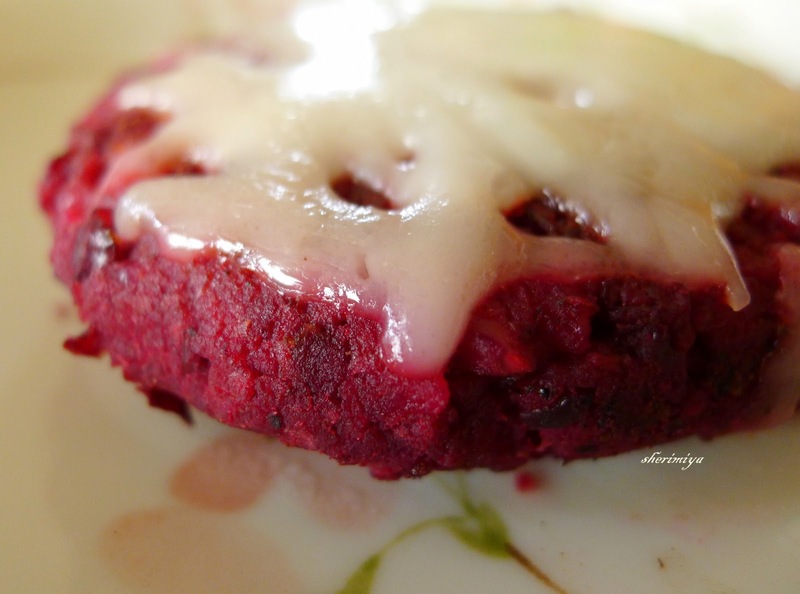 Beet burgers were a big hit though.